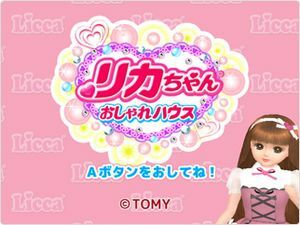 In Licca-chan Oshare House you can enjoy changing clothes mini-games of Rika-chan. When you play a mini-game you get a fashion item such as Rika's clothes and shoes. Collect fashion items, dress up Rika-chan! More than 60 kinds of fashion items! There are also accessories such as hats and bags. The graph below charts the compatibility with Licca-chan Oshare House since Dolphin's 2.0 release, listing revisions only where a compatibility change occurred. This page was last edited on 26 January 2018, at 14:36.